This is the first article written on this website on cleaning concrete floors. We are glad to finally explain the procedure steps of daily cleaning concrete floors in commercial buildings but we will also address some major myths on what the Concrete Producers and Trade Organizations are doing to promote their product line…concrete floors. We will address the main myth and explain the reason for an increase in using concrete as flooring in retail, malls and other buildings that traditionally would never consider using concrete other than a base substrate beneath the flooring such as tile, wood, etc. Let’s take a look at the increase popularity of using concrete floors in commercial buildings such as stores malls, airports, etc. Concrete has become more popular every year and has been growing for about the last 10 years. Wal-Mart, Menards, Lowes and Home Depot stores have been moving in this direction to save construction cost and maintenance of the facility. This overall cost savings has more retailers testing concrete for their stores’ floor. This trend is driven by cost savings and the decision that customers are less concerned about the appearance of the floor as long as it is clean. Myth #1: No top coating with a seal for protection of the concrete is required making it Maintenance Free. The concrete industry has been selling this concept (Myth) to the commercial building market and that concrete floors that are polished through a grinding process and a treatment process (not with a seal or top coating) will be easy to clean and will keep soils from penetrating into the pores. They are selling the point that there is no need for top coating the concrete floors with a Floor Finish, Wax or Seal. This is a COMPLETE AND TOTAL MYTH or wishful thinking or a lack of understanding of cleaning floors. The concrete industry has been selling something that is not true and after the last 7 to 10 years, the myth is being exposed and with stores and buildings that have installed concrete floors, the soiling and staining of the concrete floors that was not sealed and maintained with a top coating are proving that the unprotected concrete cannot be cleaned with adequate results because the soils are so deeply imbedded into the floor. Furthermore, the stains have damaged the concrete and can never be repaired without grinding the concrete floor which is expensive and disruptive to employees and customers of the building. Top coatings not only beautifies the floor with a gloss but it’s primary reason for using a top coating on a floor is to protect the floor from damage and prevent soils from entering deep into the pores of the floor. Once a floors pore is deeply soiled and/or stained, the cleaning is for far more difficult and in some instances, especially with concrete, cleaning can be impossible to remove all the soils and stains. Myth #2: You only need plain water to clean concrete floors. This is also a falsehood and a myth. Plain water does not clean as well as using a cleaning product. We could go into a long explanation of why you need a cleaner to clean the concrete floor but for time sake we will not. Ask yourself this question, would use clean your clothes with plain water or use a laundry detergent. If you answer is yes you would use a laundry detergent. 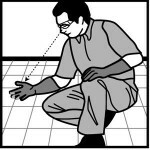 The same principle applies to cleaning concrete floors. What to Do: Contact a quality chemical coatings manufacturer to discuss what can be done to both correct soiling and staining problems or how to prevent the problem from occurring. It does not have to be costly and in the long run will save a huge amount of money. We have supplied two of the most popular and recognized names in this area regarding concrete floor maintenance programs. 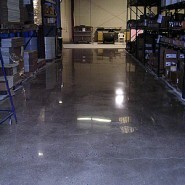 Another expert is D&B Industrial Floor Coatings, Inc. who is concrete polishing service and Product Company. They are incredible experts in the polishing of newly installed concrete floors and perform polishing of concrete floors through a grinding or honing process and also apply a chemical treatment that tightens the surface but none of this will prevent soils and staining of uncoated concrete floors. D&B Industrial Floor Coatings, Inc. is out of the Milwaukee area understands this and has completed the polishing process of Hundreds of million square feet of concrete. They will confirm that a top coat is needed to maintain concrete floors as well as using floor cleaners are also necessary for cleaning concrete floors. See their attached website later in this article. We are not suggesting that the concrete industry driving the use of concrete floors in commercial buildings were lying about their marketing points of maintenance free floors but most likely they did not understand the daily cleaning end of the facility and have made a mistake in suggesting the use of concrete floors will be maintenance free. We hope what was discussed above and with your further research from the companies websites below will prevent and save you money and headaches. Dust mop or Sweep Floor. Using a putty knife or scraper, scrape any debris adhered to the floor such as gum, labels, etc. Dust mopping with a microfiber dust mop is the preferred method of dry cleaning. 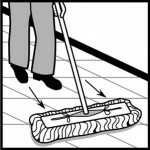 In tight and confined smaller areas of the commercial building use a damp mop method for daily cleaning concrete floors. Fill a bucket with a quality grade Neutral Floor Cleaner or Hydrogen Peroxide Cleaner using according to label directions. Using a wet mop, damp mop the cleaner solution uniformly on floor with the mop. 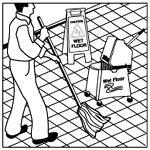 For open unconfined areas, use an automatic scrubber to clean the concrete floor. Fill the solution tank with a quality grade Neutral Floor Cleaner or Hydrogen Peroxide Cleaner using according to label directions. Utilize a pass procedure with the automatic scrubber, laying the cleaning solution down and vacuuming up the solution in one pass. Inspect floor after it has dried. If any residue is present, repeat rinsing step by damp rinsing with a mop and bucket filled with clear potable water.